Aged Care… so much more than just a job! With the number of people requiring some form of aged care set to double in Australia by the year 2050, the demand for skilled workers is increasing rapidly. The industry is seeing exceptionally strong future growth and according to a 2016 Adzuna job market report, position vacancies have doubled and employment trends predict that the aged care sector will be one of the largest employers over the next 20 years. 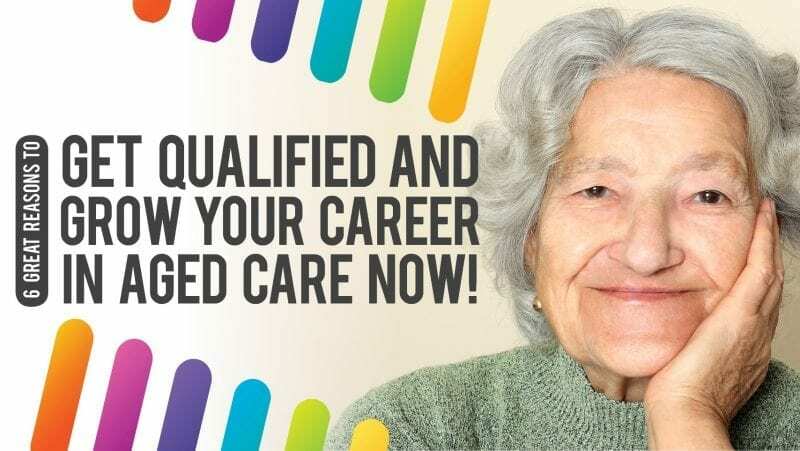 This means there is ample opportunity for you, once qualified, to gain a position within the aged care sector relatively quickly and begin to start building a successful and fulfilling career. Aged care support isn’t just about changing bed pans and helping people get out of bed. There are many positions within the aged care industry to suit a variety of skills and personalities. There are careers in frontline support, administration, human resources, and catering as well as managerial and corporate roles. There are also a variety of environments that support workers can work within too. If working with the elderly isn’t for you, you may choose to work with younger people with disabilities or families with people who need additional support. Careers can be sourced in community care where you can offer your support and services to people in their home, at a residential aged care facility providing continuous nursing support or assisting in a community-based facility. Aged care work is rarely 9 till 5. Training.gov.au reports that up to 63% of work in this industry is part-time, meaning there’s lot of flexibility. Given that you don’t have to be tied to a strict schedule for work, many workers enjoy being able to work around their plans, rather than plan around work. The added benefits of penalty rates for night shifts and weekend work make this industry exceptionally appealing to busy mothers and carers. The aged care industry needs all types of workers at all levels. Many workers enter this industry as support staff and with hard-work and ongoing training, work their way up to managerial positions. Many workers begin their journey into the industry by studying a Certificate II or III. As they fall in love with the industry, we often see students return to study Certificate IV or Diploma courses to compliment their on the job training. If you’re looking at entering the industry, we suggest taking a look at CHC33015 Certificate III in Individual Support. This introductory qualification opens up a range of positions for you in the industry, from personal care worker to home care assistant and residential care worker. There are several key skills and attributes that aged care workers require to build a successful career in the industry. Employers look out for those with a caring and supportive attitude, good communication skills, patience and discretion and physically fit. Embodying a positive outlook, having a high level of professionalism and showing a natural empathy towards the elderly or disabled are also desirable traits of most aged care workers. Because the industry is filled with naturally caring and supporting people, many employers often find that their colleagues become life long friends. Without a doubt, working in the aged care sector can become an extremely rewarding and fulfilling career. While the primary focus of support workers is of course treating ailments and maintaining proper health, there’s so much more to the practice than the medical side. You’ll interact with patients throughout the day, developing relationships and providing emotional support. These individuals often need someone to confide in, help with an easy task or simply provide a friendly smile. Sharing a cup of tea and conversation goes a long way to making a patient’s day more enjoyable, as each moment in their life counts. Leave your details and one of our friendly team will be in contact with more info about the courses we offer to grow your career in this vibrant industry!